The Fiserv Forum is the new Milwaukee Bucks arena, and also features Marquette University men’s basketball games and a variety of concerts. The forum, as most people are calling it since it was finished, is also the center of a new entertainment hub, which includes an outdoor space for events and a few new buildings with bars and restaurants. The entire area is also on the edge of downtown, making staying nearby convenient for exploring Old World 3rd Street, Water Street, and beyond. Here is a convenient list of hotels near Fiserv Forum, all of them less than a half mile away so you can walk to the next big game or headlining concert. The best budget hotel near the Fiserv Forum is The Brewhouse Inn & Suites located only a quick 10-minute walk to the Fiserv Forum. Prices vary based on dates but can often be found for $100-150 a night, click here to check rates. Technically the cheapest hotel near the Fiserv Forum is Potawatomi Hotel & Casino but it is not in walking distance as it is 1.6 miles away. Prices are often under $100 a night, click here to check rates. 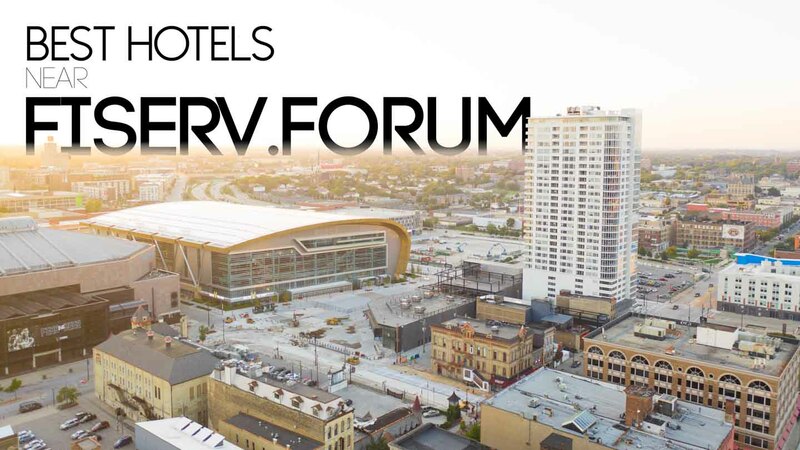 For the best-located hotel near the new Milwaukee Bucks Arena, the Fiserv Forum is the Aloft Milwaukee Downtown. It doesn’t get any closer than this. The Aloft hotel is just one short block away and several rooms offer views of the Fiserv Forum right from the hotel room. Aside from being close to the arena, it’s also close to many great dining and nightlife options too. This is arguably one of the best-located hotels in downtown Milwaukee, click here to check rates. Aloft Milwaukee Downtown by Marriott is one of the trendier hotel’s in the city. With modern decor, spacious rooms, and one of the more vibrant hotel bars in the city, XYZ bar, you are certain to enjoy your stay at Aloft. The location of this hotel could not be more ideal if you plan on visiting the Fiserv Forum. It’s only a block away, and either before or after the game or concert you can head over to Old World 3rd St. for plenty of food and drink options. The new Hyatt Place Milwaukee Downtown hotel was just recently finished, and it promises to be an excellent option for places to stay. 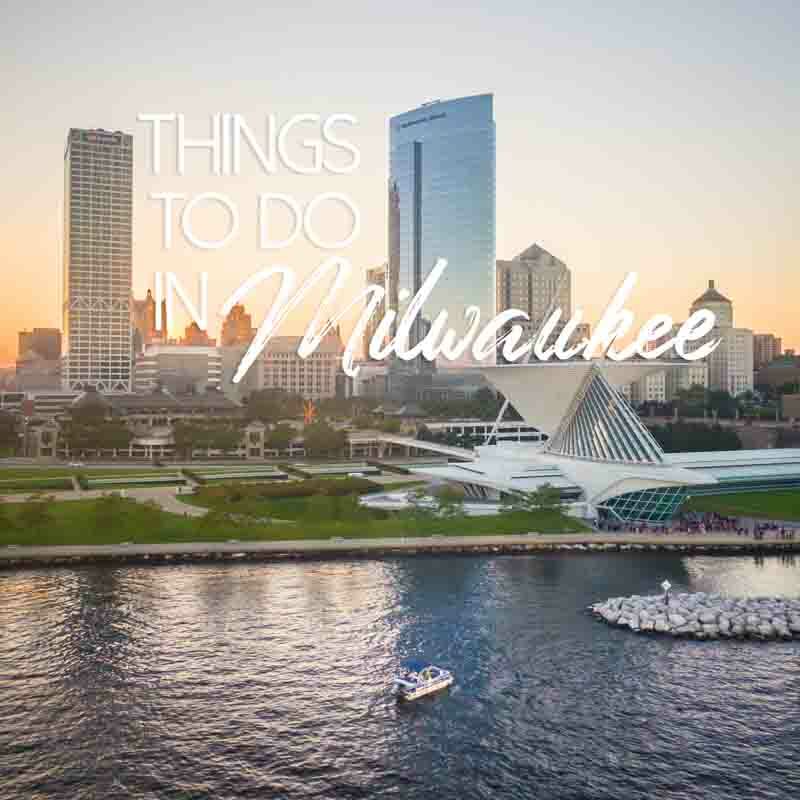 It sits right on the edge of the Pabst brewery district, which besides for being only a couple of blocks from Fiserv Forum, also means you can explore numerous walkable attractions, like Best Place at the Pabst Brewery, MKE Brewery, and Jackson’s Blue Ribbon Pub. The hotel offers breakfast options and 24/7 snacks and boasts spacious rooms. Check out the new Hyatt Place Milwaukee on your next trip to Milwaukee. The DoubleTree by Hilton Hotel in the center of Milwaukee’s west town is a half mile from Fiserv Forum, which still enables walking unless its an especially cold winter’s day or night. Besides for its convenient location, the DoubleTree also features a great restaurant, Avenue Bar & Grill, for lunch, dinner, or drinks, in addition to a rooftop patio bar and restaurant, open seasonally. Its location on Wisconsin Avenue makes for an ideal launch point to explore other parts of the city, and this hotel is pet-friendly, in case you are traveling with a furry companion. The Brewhouse Inn & Suites is the only boutique hotel to make the list since the others would ensure you need to take public transit or rideshare over to Fiserv Forum. The Brewhouse is located inside of what once was a Pabst Brewery building. In fact, some of the enormous brew kettles still sit in the center of the hotel. With great decor and a modern vibe to the rooms, the Brewhouse quickly has become one of the most sought after hotels in the city. Since it’s located in the Pabst neighborhood, you can also walk over to MKE Brewery or the micro-brewery located inside of the old Pabst church before or after the game. If you have time make sure to take check out a local brewery and go on a brewery tour in Milwaukee. The Potawatomi Hotel & Casino is located in the Menomonee Valley just outside of downtown Milwaukee. The price is great and the hotel is brand new and super modern. It’s a great price if you’re just coming in for a game or concert and need a place to crash. There isn’t much to do around the area, the only restaurants & bars will be located in the Potawatomi Hotel & Casino. City Lights Brewery is less than a mile away which would be a great spot for a drink before or after the game. It’s a quick drive or you can just as easily take an Uber/Taxi to the Fiser Forum. With the traffic before & after events and the cost of parking at the Fiserv Forum, we would advise taking an Uber. The Fairfield Inn & Suites by Marriott is well-suited for business travelers and other tourists looking for an affordable but comfortable stay. The hotel offers complimentary continental breakfast, and though there is no bar or restaurant, it is a short walk to nearby bars like Mo’s Irish Pub or excellent restaurants, such as Capital Grille. A short walking distance from both area attractions and the Fiserv Forum makes the Fairfield Inn & Suites a quality choice for staying in downtown Milwaukee. The Hilton Milwaukee City Center is one of Milwaukee’s most iconic hotels, especially given its prominent Hilton sign that helps define the Milwaukee skyline. Located on Wisconsin Avenue, the Hilton has tons of rooms, great service, and puts you right at the doorstep of all of Milwaukee’s top attractions. The hotel also features two restaurants, the excellent steakhouse Milwaukee Chophouse, and the more casual Miller Time Pub & Grill, along with a Starbucks for a coffee before heading over to Fiserv Forum. The Hyatt Regency on Kilbourn Avenue makes for a short trip over to Fiserv.Forum. Like most Hyatt Regency hotels, the rooms are spacious, comfy, and the common lobby areas are superior to most other hotels. The location is right by the iconic Major Goolsby’s, a popular sports bar, and nearby other bars and restaurants. The hotel also has the fantastic restaurant Bistro 333, and the accompanying Bar 333 that slings up some really quality craft cocktails. The new SpringHill Suites by Marriott offers another option to the ever-expanding hotel options in downtown Milwaukee. The rooms are affordable, the location is excellent, and the adjoining restaurant is a real highlight – Doc’s Commerce Smokehouse offers tons of seats, awesome drink specials, and some of the best barbeque in the city. The hotel also features great business lounges, and given its location, you can make an easy path over to Fiserv Forum.